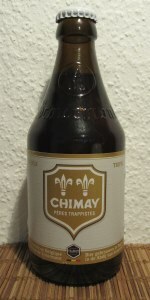 Labeled Chimay Cinq Cents in 750ml bottle. This blonde ale is dry and floral with a slight hop bitterness. The hoppiest Chimay ale, Cinq Cents was created by famed brewmaster Father Theodore in 1966. Had it on tap ona Chimay chalice. Clear yellow it’s a nice head and great lacing. Pleasant bready, slightly earthy smell and taste. Flavors of sweet apples and pears and a bit of pepper. Another Belgian beer to enjoy! Murky orange in color after an aggressive pour. Poured with a thick, creamy, sticky white foam with excellent retention. Sweet malt, candy sugar, banana and bubble gum aromas with a hint of pepper. Medium bodied with effervescent carbonation and pleasant warmth near the finish. Mellow, spicy, peppery flavors up front transition to sweet malt and banana flavors. Medium light spicy bitterness combined with boozy bite through the middle. Spicy bitterness with light fruity notes on the back end. Finished with fruity flavors and light lingering spicy notes. A plethora of Belgian esters, none of which dominate the flavor profile. Sweet, spicy, fruity, malty, boozy, everything a triple should be. 330 ml bottle with a best before of 12/2021. Poured into a Tulip. Look: Pours a Golden orangy amber with about 2 inches of very fluffy off white head. The head hangs around for some time. Sticky lacing. Smell: yeasty, a little spicy, raisin/dried fruit. Little bit of honey sweetness comes through. Taste: A bit fruity up front, bitter orange, touch of sweetness, honey and candi sugar. A little spicy and a hint of clove underneath. Finish was a little bitter than I was expecting. Feel: quite mouth filling. Mid to heavy bodied, heavier than I was expecting. Finishes bitter at the back of the palate, Decent depth. Overall: Excellent beer. Rich and flavoursome. One of those beers I will always go back to every now and again. Doesn't have the usual big Belgian yeast flavor I was expecting.. More of a flowery pear type flavor , very light and easy to drink .. Reviewed as part of BJCP training, 26C Belgian Tripel. Don't drink Belgian all that often, but I like them, and often get this one when I'm in the mood. Nice, crisp flavor, and plenty of it. Hoppier than most Belgians, less of whatever you call that spiciness they have. A solidly refreshing beer. Hazy, translucent golden copper with a fluffy white head. Good retention and lacing. Smells of honey, orange, ginger, cardamom, and hay. Tastes like orange, ginger, cardamom, hay, honey, toast, dried apricot, hay and clove. Medium mouthfeel, fizzy and rolling carbonation. Dry and musky, like dust motes dancing in the pale light of a forgotten window. Prevailing floral hints of old fashioned perfume. The slightly tangy, piquant smell of old furniture and cooks stacked in clumsy piles, bringing back the timeless feeling of an unrestricted afternoon. And throughout it all, hints of the spiced and drunken fruitcake as is baking in the kitchen below... there’s always something new to discover in Grandma’s attic. Some-transparent amber appearance with white head that dissipates quickly. Aroma is a slightly sweet fruity. Taste is a very smooth slightly sweet fruity. 뭐 하나 빠지는것 없이 뛰어나서 전부 4.5로 적었다. 지금껏 먹었던 트라피스트 트리펠 중에서 가장 인상깊은 맥주다. 쿼드라펠로 넘어가면 또 이야기가 달라지기는 하지만.. 인상깊은 맥주다.